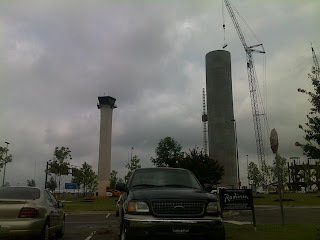 I posted a brief in late May about the rising landmark over Memphis International Airport - a brand-new 336-foot control tower that is under construction. 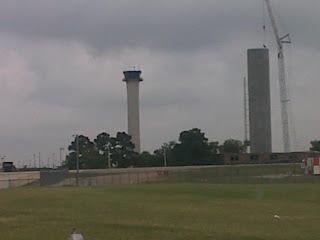 Within the past few weeks, the new "under construction" tower has surpassed the height of the old control tower and continues to rise! I've posted a few pics above - the third is taken at an angle to best show their respective heights without an angle distortion. You can clearly see how it is not only taller, but the tower is also wider. (I've been up in the current tower and the elevator fits about 4 people - it's tiny!). The final 336-foot height will be about 150 feet taller than the current tower and provide controllers with unparalleled visibility of the entire airfield. The new tower is expected to be commissioned in 2011 (but the exterior construction will be done sometime in 2010) and will cost $55 million. 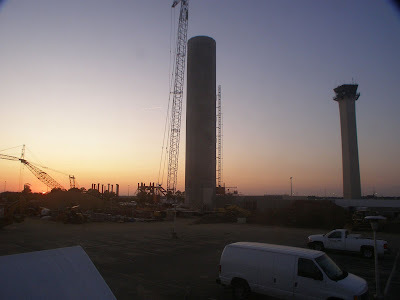 Click here to see the new tower webcam - I've posted this evening's sunset picture from the cam below. Good to hear from you Carl. It's beautiful (for a 300' tall structure!). It's really starting to take shape with the cab being assembled now. 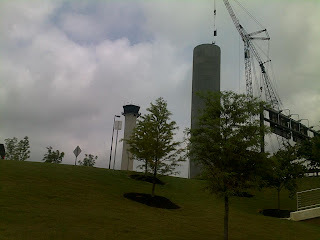 Are you up on top of the tower welding those pieces together as they get hoisted up?